Intensive 2 days Classroom/LVC Training and 2 months LIVE Project mentoring. Unlimited access to Data Science Cloud Lab for practice. In today's business, every feedback or comments from each and every customer is of highest important than ever before. Given the impact of social networks, every piece of text about a product or an organisation is directly related to the business. It is estimated that about 70% of this data is unstructured in social networks such as facebook, youtube etc., and mostly in text format. This courses focusing on collection of Text mining techniques to analysis unstructured text data to transform them to insights for business decision making. The topics cover preprocessing the text data, analyzing with various text mining techniques, visualizing with real-world case study. Text Mining introduction, Sentiment Analysis with R and Positive and Negative Word Cloud. Also would have gained knowledge on Advanced regression using R language and the theory behind it. Recommendation engine and the theory lying underneath is also touched upon. This courses doesn't have mandatory prerequisites. Basic programming knowledge is recommended. Why this course “Text Mining”? Text Mining is one the areas of Data Science with wide business application. This course will get you ready for Data Analyst and related jobs in the market. Data analysis of Business text data requires an important factor, that is understanding of natural language text. Since this is not possible with computers, you need effective statistical approaches along with computer language to attain potential information. Hence, Text Mining is considered as a next big thing in Business world. With limited Text Mining experts around, learning this “Text Mining” course will improve your efficiency as a business analysts and brings a definite uplift in your career. Freshers, IT Professionals, Business analytics, Web Marketing analysts, Data Mining and statistical consultants with a knowledge of Basic statistics and R language, can take up this Text Mining course to learn the techniques of analysing the natural language text data. In general, analysts who wants to pioneer themselves in this charming Text Mining field can pick this course. At DataMites™, we truly believe and very excited about this big wave of Data Science. There are millions of jobs and business opportunities across the globe as of today and this is only going to increase exponentially in coming years. DataMites is founded by a group of passionate Data Science evangelists with decades of experience in Analytics, big data and Data Science working with fortune 100 companies, across the globe. The mission of DataMites™ is enable data science professionals with strong data science skills aligned market requirements and be a part of this phenominal Data Science era. JOB ASSISTANCE: A dedicated team , Placement Assistance Team (PAT), is tasked to assist candidates in preparing for the first Data Science job and mapping the job requirements to individual candidate profile. FLEXIBLE LEARNING: DataMites™ provides flexible learning options from traditional classroom to Virtual classroom, Instructor led online and self learning. LIBRARY: A Data Science library with collection of valuable Data Science books and publications, assisted check-in/check-out options. FRIENDLY STAFF: A friendly staff and dedicated counsellor, who are trained to guide you in your career ambitions. What is the mode of Learning: Classroom, Online or distance course? What are the unique features of this course? This course is perfectly aligned to the current industry requirements and gives exposure to all latest techniques and tools. The course curriculum is designed by specialists in this field and monitored improved by industry practitioners on continual basis. How to I validate IABAC™ board certificates? All certificates can be validated with your unique certification number at IABAC.org portal. You also get candidate login at exam.iabac.org , where can find your test results and other relevant validation details. How long it takes to get IABAC™ certificates? The results of the Exam are immediate, if you take online test at exam.iabac.org portal. The certificate issuance, as per IABAC™ terms, takes about 7-10 bussiness days for e-certificate. Do I need to pay separately for the examination? No, the exam fees are already included in the course fee and you will not be charged extra. Can I pay the course fee in part payments? Do I get job assistance after the course? DataMites™ has a dedicated Placement Assistance Team(PAT), who work with candidates on individual basis in assisting for right Data Science job. Can I get the fee refunded, in case I choose to discontinue? Do I get the materials for further study? DataMites™ provides loads of study materials, cheat sheets, data sets, videos so that you can learn and practice extensively. Along with study materials, you will get materials on job interviews, new letters with latest information on Data Science as well as job updates. This course covers following concepts. Datamites 5 out of 5 based on 3 ratings. 3 user reviews. Very iformative, concepts where very easy concepts can be implemate in the work areas. Quality learning, good experience to get training from the trainer. If u want to start ur career as a data scientist in short span of time ..I would suggest DATAMITES institute, it’s great place to learn. Trainer, Mr.Ashok has been excellent and he covered almost all algorithms in Machine learning and good knowledge on statistics too.He will connect every problem with real time examples that will help us to learn quickly.All the best to all ..happy learning. A good institute for people who want to start their carieer in data science or machine learning.Excellent tutor.. Ashok is very patient and experienced person... Thank you sir, that has been a wonderful journey. If you are new to analytics, this is a great place to start the beginners level. Even if you do not know coding, just put a little effort and you will be fine.Ashok is very good at what he teaches especially machine learning Regarding improvement, a bit more detailed coverage regarding statistics concepts is required. It's very good institute for Data Science and Machine Learning.Trainer(Ashok) is very good and helpful.Trainer will teach Data Science and Machine Learning with Python.He will also teach basic of Deep Learning and Tableau.overall it's very good place to learn Data Science and Machine Learning for both technical and non-technical people.We search a lot of courses online to learn data science and machine learning. Trust me the subject and its application is massive. Its not a joke to learn such a subject in a short period of time. I recommend the course for everyone who are interested in starting their journey towards DS & ML. Every single penny spent here is worth it. Trust me you will not be disappointed. Trainer Ashok is exceptionally good. Best part of the Training is along with Theory concepts, we are asked to practice live in the class itself. All essential things are covered to start our journey in Data Science domain.Apart from the Training aspect, job assistance and support from PAT Team should be improved. Response rate is low. It's very good institute for Data Science and Machine Learning.Trainer(Ashok) is very good and helpful.Trainer will teach Data Science and Machine Learning with Python.He will also teach basic of Deep Learning and Tableau.overall it's very good place to learn Data Science and Machine Learning for both technical and non-technical people. Feel so satisfied with the training going on. The trainer (ASHOK) explains each topic in detail. Quires are clearly explained within the training session . A non techie guy can also understand the exact work flow of any ML(machine learning) and work on any project related. His teaching and command on Data science helps us to learn and explore more on Data-science in short period. Its a good choice to get associated with Datamites.Ashok makes Data-science much easier. We search a lot of courses online to learn data science and machine learning. Trust me the subject and its application is massive. Its not a joke to learn such a subject in a short period of time. But Ashok (The trainer) makes life easy for you in this journey of getting acquainted with data science and ML. His experience is vast and the way he teaches is very easy to understand. Though i am not from engineering background, i am able to create models and understand python as a language and apply it.I recommend the course for everyone who are interested in starting their journey towards DS & ML. Every single penny spent here is worth it. Trust me you will not be disappointed. Great place to start! !Topics covered and examples given are perfect . Mr. Ashok is highly knowledgeable and the staff members were friendly worth it. Datamites is one of the Excellent place for Data Science. The management is Awesome. My trainer Mr. Ashok Kumar is Excellent Coach for Data science. I would like to take this movement and thank you my trainer and management for their support in my learning. Thank you Ashok sir and Thank you datamites team.Regards,Ramdas. DataMites Is a great place to gain knowledge compaire to other traning institute in Bangalore.It's Excellent place to learn Data science and Machine Learning.The traning is highly structured and well designed for jobs in Data Science, behind this Non other one My trainer Mr. Ashok Kumar(IIMA), who is Master inData science and Machine Learning. I am blessed to have best trainer like Ashok, its really best training institute in Bangalore. Finally I show a Immune gratitude towards trainer and staff. Best place to learn data science from the master himself.Mr. Ashok is a stalwart when it comes to ML and DS.His knowledge and experience are priceless.His ways of teaching are seems less and near perfect.Cheers Datamites!! 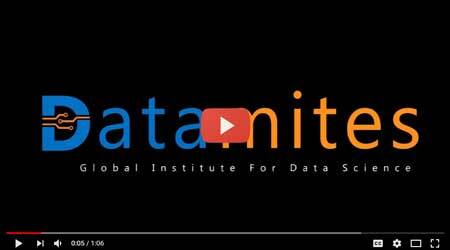 DataMites is one of the best institutes for data science training in Bangalore. Training sessions were very interactive. Trainer has very good subject knowledge.Thank you Datamites for wonderful and fruitful training.